Menopause is defined as the time when a woman becomes infertile. After 12 months without a period, a woman is considered to have reached menopause. Exceptions exist only if there are underlying medical reasons for missing or irregular periods. Perimenopause is a phase that signals the start of the menopausal transition. During this stage, experiencing periods is normal, but they might become irregular and negatively affect your chances of becoming pregnant. Read on for more information on pregnancy during perimenopause. 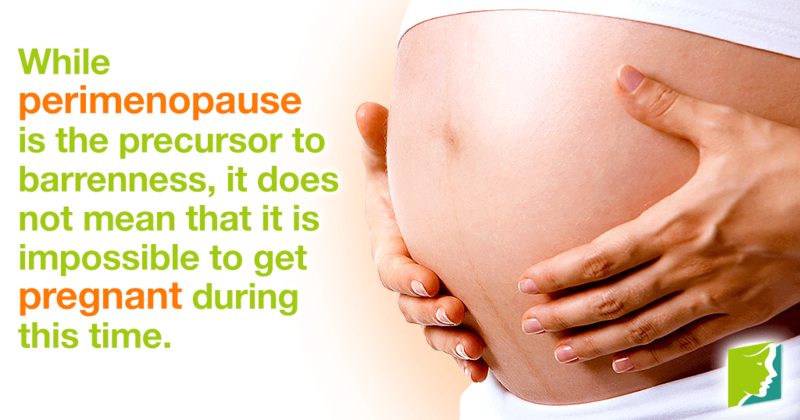 Perimenopause signals the end of a woman's reproductive years. It is a time when the body starts making the biological changes necessary to achieve menopause. During the transformational period, side effects can include vaginal dryness, irregular periods, and hair loss. These are common menopause symptoms caused by the hormonal changes associated with the transition. Hormones help to control many functions in the body, like the menstrual cycle and sodium and fluid retention. Generally, your body retains a sufficient balance of necessary hormones. However, during the menstrual cycle or perimenopause, hormone levels fluctuate. This fluctuation can create chaos in the body and lead to many of the symptoms associated with menopause. Read on to discover how perimenopause affects fertility. While perimenopause is the precursor to infertility, during this stage, it is still possible to become pregnant. Pregnancy remains a possibility until a woman stops ovulating and experiencing the indicative accompanying periods. However, the hormone imbalances that occur during perimenopause can lead to disruptions in your menstrual cycle and cause irregular periods. If you are not menstruating regularly, it becomes more difficult to get pregnant. It is additionally worth considering that pregnancies that occur after a woman reaches her 40's are more likely to incur difficulties. Due to a combination of aging eggs and fluctuating hormone levels, while still possible, a woman's chance of becoming pregnant during perimenopause is lower than experienced during previous menstrual cycles. Due to the sporadic periods during perimenopause, it can become difficult to recognize when a woman is ovulating. It is suggested, therefore, that woman seeking pregnancy rely not only on their menstrual cycle, but also look out for classic signs of ovulation, such as breast tenderness and slippery white vaginal discharge. In some cases, classic ovulation induction can successfully culminate in pregnancy during perimenopause. As perimenopause is an inevitable natural process that every woman experiences, it is not possible to reverse its effects. However, actions can be taken to ease the transition and minimize its associated symptoms. Methods for combating perimenopause symptoms include lifestyle changes, alternative treatments, and, in severe cases, hormone replacement therapy. Learn more about the treatments available for perimenopause. Too young for menopause? You may be experiencing the stage that comes before, known as perimenopause. Read on for the best tips to treat the symptoms.